Hi guys! Are y'all as excited as I am? Christmas is right around the corner, along with my favorite meal of the year -- Christmas Eve dinner! In my mind, Christmas Eve and crackers go hand in hand and here's why: When I was growing up, my mom believed cooking a big, fancy meal two days in a row was not much of a holiday for her, so we had our big meal on Christmas Day and she served crackers and cheese on Christmas Eve. It was perfect because we were always so excited we could hardly eat anyway. This is a tradition that my husband and I have carried on in our own family. 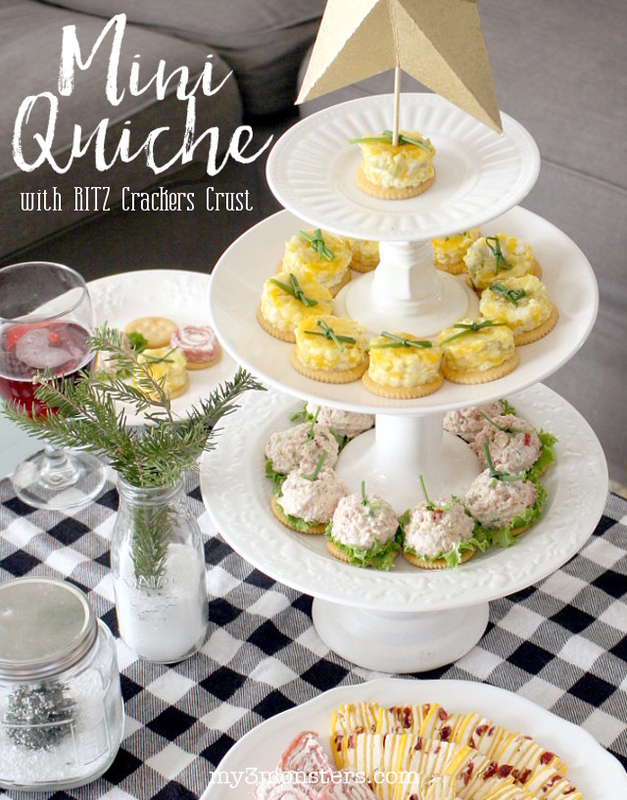 Over the years we have expanded the menu a little bit from the traditional summer sausage and cheese tray to include other delicious finger foods, including Mini Quiches with RITZ Crackers Crust. These mini quiches are made by baking a delicious green chile and pepper jack cheese egg dish, then using a small cookie cutter to cut perfectly sized individual pieces once it has cooled and set up a bit. RITZ Crackers make a perfect "crust" and add a yummy, buttery crunch. The best part? Everything you need for this casual dinner can be purchased at Walmart while you are out picking up your last-minute stocking stuffers! Click on the image below to save on your purchase. Preheat oven to 350 degrees. Toss shredded cheeses with flour in mixing bowl to coat. Add eggs, milk, green chiles, salt and pepper to bowl and stir to combine. Prepare a 9x13 baking dish by spraying well with non-stick cooking spray. Pour the egg mixture into the prepared dish. Bake for approx. 30 minutes, or until top is golden and middle is firm and not runny. Remove from oven and allow to cool until it has set and feels firm. Use a small round cookie cutter (approx. same size as cracker) to cut out individual pieces of egg, or cut into small squares using a knife. Carefully remove each piece from the pan using a small spatula and place on top of crackers. Garnish with chives and serve while warm. -- Salami Roll. Use thin sliced salami from the deli and 8 oz. of softened cream cheese. Lay the salami slices out, overlapping edges, to form an approx. 11 x 14 inch rectangle. Carefully spread softened cream cheese to form an even layer on top of salami. Beginning on one long end, carefully roll salami and cream cheese to form a log. Wrap the log in plastic wrap and refrigerate several hours or over night before cutting into thin slices. -- Cheese Ribbon Slices. This recipe has been a BIG hit with everyone who has tried it. The original recipe calls for nuts, but since my husband doesn't really care for nuts, I omit them and add a few extra dried cranberries. These cheese ribbon slices look super impressive. No one will believe how easy they actually are. -- Cheese Ball. Homemade or store bought -- whatever your family likes. I usually pick up a green onion cheese ball from our local store's deli and it is always one of the first things gone! -- Pepper Jelly. Just a little smidge of sweet and spicy pepper jelly, plain or with cream cheese, makes a super yummy addition. --Shrimp with Chili Sauce. Like the pepper jelly, serve it alone or with a small schmear of cream cheese, and it's delicious on top of crackers! Every year I over-prepare and we have more food than 5 people could possibly eat. (What can I say, we like to have a wide variety!) Wouldn't it be fun to host a "Jingle Mingle" on Christmas Eve and invite friends who don't have family in town to come hang out for a bit and share your crackers and cheese dinner? To make your Jingle Mingle extra special, display finger foods and crackers on tiered trays to resemble Christmas Trees. My tiered display stands were made from white dishes and candlesticks I picked up at the thrift store. Set up several small snack tables with different food options around the room instead of one central buffet table to encourage mingling and snacking. This one on my coffee table is perfect for friends to get cozy on the couch and chat while having plenty of yumminess within reach. You can even use your empty cracker boxes to make cute 3-dimensional stars like this one to accent your tiered trays. I'm all about using EVERYTHING I've got on hand!! Step 1: Find a star that you can trace onto and cut out from your cardboard boxes. I made a bunch of these 3D stars out of scrapbook paper years ago, so I just traced one of those. If you don't have a star to trace, you could draw your own template by following this tutorial I wrote here. Step 2: Use a ball point pen to score your cardboard by drawing a line from each star point to the inverted point directly opposite it using a straight edge. (I used one of the discarded cracker box edges!) Fold along each scored line. Step 3: Push the creases outward on each star tip and inward at the inverted points to create the three dimensional effect. Step 4: Spray paint gold (or any other color that matches your decor) and use hot glue to attach a bamboo skewer to the back. If you want your star to be double sided, simply make two in the same manner and hot glue them together around the edges with the bamboo skewer sandwiched in between. This dinner could not be simpler to put together. Just set up a few cute food stations with crackers, cheese, and finger foods, turn on some festive music, and bring on the guests for a fun and relaxing Christmas Eve get-together! I even created printable invitations for y'all to use to invite all your friends and family -- one for a Christmas themed Jingle Mingle and one for New Year's Eve Party! Download the image you like here, upload it in PicMonkey or another photo-editing program you like to add your party details in the blank spaces, and have them printed as 5x7 photos. 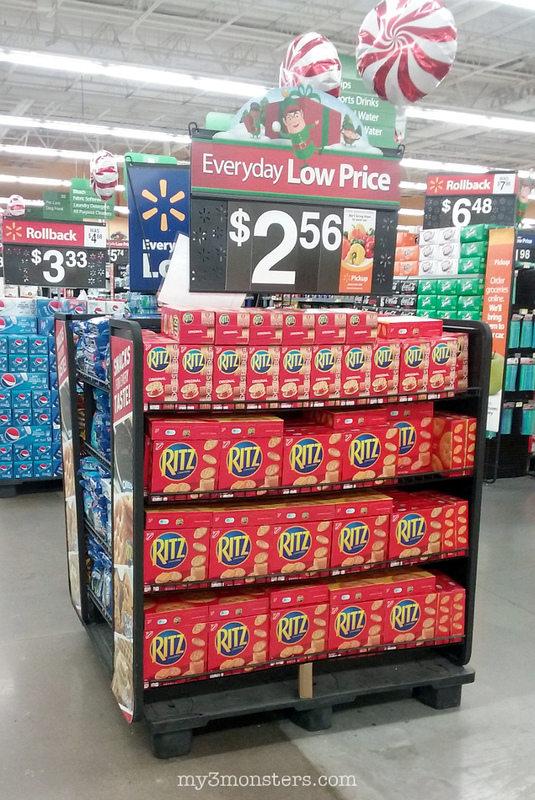 For more delicious recipe ideas, be sure to visit the #HolidayRITZ page. What are your favorite finger foods and cracker toppers? I would love for you to share your ideas in the comments. Happy holidays, friends!